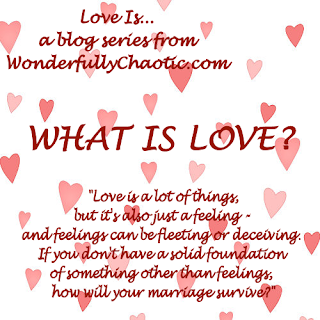 Marriage Monday: What Is Love? When couples come to me for pre-marital counseling, I sometimes ask: "Why do you want to get married?" Whatever else, they say, they always give me the big reason; and the big reason is always the same. What do they say? "We love each other." Then I ask a very unfair question: "Tell me, what do you mean by that?" There is silence. Then, one will say, "Oh...you know!" I guess maybe I do know. I think they are talking about a euphoric emotion that makes them oblivious to reality. They are the happiest they have ever been. What they don't know is that the euphoric feelings will last for two years and then they must find another foundation for marriage. Wouldn't it be better to explore that foundation before they get married? This is oh so true! Love is a lot of things but it's also just a feeling - and feelings can be fleeting or deceiving. If you don't have a solid foundation of something other than feelings, how will your marriage survive? I'm not saying you shouldn't feel like you're in love. It's one of the most wonderful feelings in the world. But there needs to be more than just that! - Love is a choice. - Love is a way of life. - Love can be learned. So stay tuned as I'll be putting the other posts up this week. 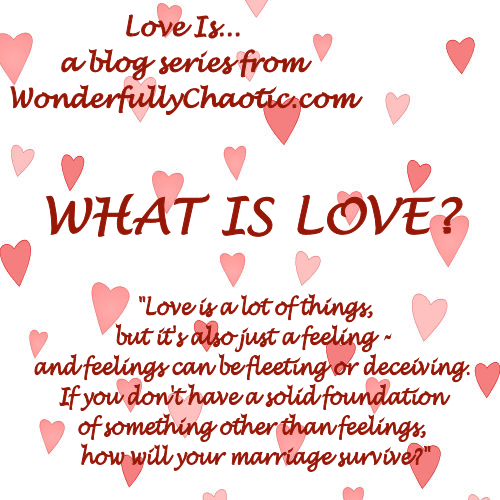 For now though - what is love to you, dear reader? Share your thoughts with me in the comments. This is my post for Marriage Monday. Hop on over and share your thoughts on marriage! Love is the dishes being washed without asking. Love is watching your husband carry a toddler and an infant and offering to take your bag. Love is inside jokes and silly conversations late at night about nothing. That's so true. My mom wanted me to make a list of all of the qualities I wanted in a spouse, and when I met Adam, he had all of them. I think that it's a good idea to do that before you get married. Find out if you want the same things, share the same views, have the same ambitions, etc. Adam and I have been married for 6 years, going on 7, and we still continue to speak like twins do - taking words out of each others mouths, or doing something the other forgot without prompting. It's amazing how even this far into our marriage, we still have so many things in common, and are every day learning about each other. I still feel like a newly wed with him, and I think it's because we're so in tuned with each other and we both knew before we were married, that there was no one else we could find that would have been all the things we were to each other. So, when my kids grow up, I will ask them to do the same. Make a list of everything the desire in a mate, and never, ever settle for less. Realistic lists, of course. Such as spiritual, emotional, physical, those types of desires. It's important you're on the same page especially when the "newly wed" stage goes away. What is left, when the passionate crazy head over heels feelings fade away? You have to have a foundation for love that is stronger than physical and emotional bonds. Oooh. I would love to jump in next week. Yes! Love, especially over the years needs to be something more than the euphoric feelings. It's no wonder the divorce rate is rising when spouses will just decide they don't want to deal with each other anymore and move on. I think we have to re-write the love stories for our daughters, teaching them to "find" themselves first because later, their spouse will not be the one to make them happy! These qualities of love are so true. It's not really what we hear from the world, but it's the truth, and it makes such a difference in our marriages when we think about what's true. I think my post today about Building Up in Mercy is a great picture of what love is ... it's giving mercy undeserved, it's a choice, and it's given gladly with no "counting points." I think the list sounds like a great idea! And it's wonderful that you two are so in tune with one another. Thanks for sharing! 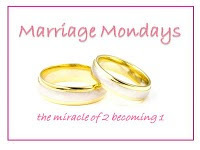 Definitely check it out - Julie who hosts Marriage Mondays always has quite a few people who participate with interesting posts. Love is communication, even when it is a hard topic to talk about. Love is understanding, patient, calming and comfortable. Love is also loving when you are hurt, angry and confused. Love is the decision to love your husband every morning, day and night for the rest of your lives no matter what else happens. Love is dreaming together, planning together, working together and spending time together! What is Love, Wow What a Topic You Choose Dude, Love is the inspiration for everyone .